Brand consultancy firm Interbrand has released its report on the most valuable brands in the world and has placed Apple in first place. The brand of the Cupertino based tops the list containing 100 companies and is valued at $118.9 billion. It is followed by Google, which isn’t too far off with a brand price of $107 billion. Interestingly, out of the 100 companies, 13 are technology oriented. IBM, Microsoft and Samsung are fourth, fifth and sevenths, respectively. 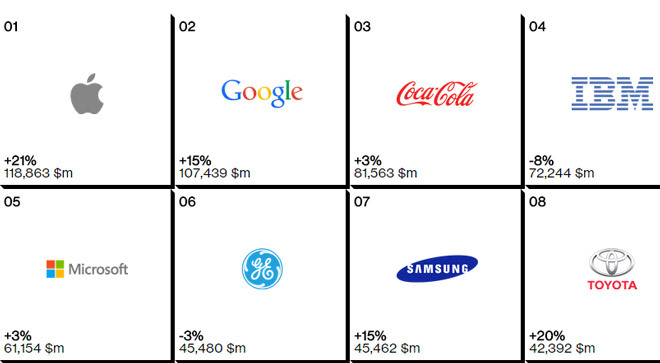 Coca-Cola is third as Apple and Google pushed it out of the top spot for a second consecutive year. The beverage company has been enjoying the number one spot for 13 annual reports in a row, but its dominance was ended in 2013. Interbrand measures a brand’s value by taking into consideration financial performance of the company’s products and service, influence on customer choice and the company’s ability to lock down earning and ensure premium price for its products. If this sounds too vague, Interbrand touts its assessment method as the first to be certified by the ISO organization (International Organization for Standardization).